Any horse, whether a registered purebred or a mixed breed with unknown parents, can compete in the Olympics. Most Olympic riders, however, choose horses from specific breeds and pedigree lines to find the best prospects for the competition. In jumping and eventing, Warmblood and light horse breeds predominate, while in dressage, Warmblood and Iberian types are common. Most of the horses competing in dressage and show jumping today are warmbloods or warmblood types. These include the Selle Francais, Trakehner, Hanoverian, Irish sport horse, Wurttenburger, Oldenburg, Danish Warmblood, Dutch Warmblood, Belgian Warmblood and Australian Warmblood horses. Warmbloods are intelligent, athletic and muscular. Nearly every member of the 2012 United States Olympic team rode a Warmblood in the London Olympics. Baroque or Spanish breed horses are exceptional in dressage, an equestrian event that demonstrates a horse's training and skills. The Spanish equestrian team is noted for riding Andalusian horses to both individual and team medals in dressage. Portugal's Goncalco Carvalho rode Rubi, a Lusitano stallion, in the 2012 Olympics freestyle Kur, a dressage competition set to music. Light breed horses include the Anglo-Arabian and Thoroughbred. 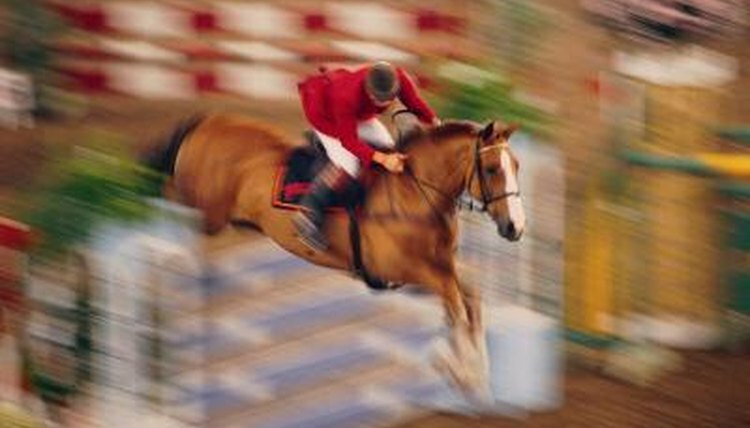 Light breed horses excel in jumping, where speed and agility are prized. Recent Olympic games featured several light breed horses on the American team. The 2012 Olympics included an Australian/Westphalian Thoroughbred, and the 2004 American team competed with a Canadian-bred Thoroughbred. Anglo-Arabs have also competed in dressage, jumping and eventing. Horses do not have to be pedigreed or purebred to compete in the Olympics. For example, in 2004, three horses with unknown pedigrees competed in show jumping in the Olympics. One famous Olympic gold medal winner whose pedigree was unknown was Halla. Halla won three Olympic gold medals in the sport of show jumping. Her dam was a French trotting horse with an unknown pedigree, and her sire was a Standardbred.